Awesome Stars is a fruity Novomatic slot game that’s set in space. The thing that makes it awesome is the fact that it has three jackpots! Awesome Stars has a mini, a midi and a maxi jackpot. There are five reels and five paylines. The background makes it look as though you’re travelling faster than light amongst the Awesome Stars. If this slot were a spaceship from an episode of Star Trek, this slot would be capable of going warp speed! This simple video slot might only have 5 paylines but any consecutive combination pays. Unlike a big proportion of other slot games, you don’t have to line up matching symbols from the left to the right. This is yet another thing about this slot that makes it awesome! Other than the fact that this slot has a jackpot, it’s a pretty ordinary fruit slot. The first slot games ever invented were fruity games! Instead of paying out money, these original slot games would hand out fruit-flavoured gum to the winners. 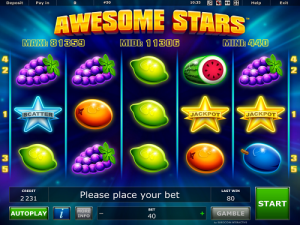 Awesome Stars online slot doesn’t pay players with fruit gum. It has a high RTP! RTP stands for ‘Return to Player’ and it’s measured in percentage. It’s the percentage of all bets made on the game that’s paid pack to players in wins. The higher the RTP, the better! Novomatic are famous for making high-paying slots! Most of their games, whether they’re fruity, animal-themed or jackpot slots, have RTPs of 95% or more. Fans of this developer favour: Book of Ra Deluxe, Lucky Lady’s Charm and Power Stars. These are the only symbols you’ll find on the reels of this Novomatic casino slot game. Awesome stars and awesome fruits are all there is! They say that we should be eating at least 5 portions of fruit and vegetables a day – but there are no guidelines concerning the consumption of stars! In Awesome Stars, you’ll want to get as many stars as you can! The fruit bowl is very full. Awesome Stars will have you craving vitamins and fresh fruit. The cherries, the lime, the plum and the orange award the smallest payouts. For these fruit symbols, 3 matches pay 2x your bet; 4 matches pay 5x your bet and 5 matches pay 20x your bet. The grapes pay up to 50x your bet and the watermelon pays up to 150x your bet! Don’t forget that any consecutive combination wins. There are 5 paylines but the matching symbols can fall on any consecutive reels! The matching fruit symbols don’t have to fall from the left in order to pay out. For example, if you spin three grape symbols, they can fall on the first three reels (left), the middle three reels or the last three reels (right) – so long as they’re on positions that follow one of the 5 paylines, they will award the win! Three grape symbols, for instance, pay 5x your bet. Hit gamble after you’re spin a matching combination of fruits for the chance to multiply your payout! There are millions and millions of stars in the sky. If you’ve ever been stargazing before, you’ll know how incredible it is to look up at all of the dazzling, twinkling lights! There are so many, you won’t know which ones to look at. In this Novomatic jackpot slot, however, it’s a different story. There are two stars you’ll want to look out for on these reels. These are the blue stars and the gold stars! Both are very precious and more valuable than the fruit symbols. The blue star symbol is the Scatter and the Wild! It pays Scatter wins and it can act like a Wild! When it goes Wild, it can complete a win for any other symbol except the gold star. The gold star is the only star it can’t act as a substitute for. The gold star is extra special and extra awesome! This shiny star is the symbol that puts the jackpot in your hands! While you’re spinning the reels, if they stop with three gold stars in line, you’ll win the mini jackpot! If the reels stop with four gold stars in line, you’ll win the mini jackpot. Finally, if the reels stop with five gold stars in line, you’ll win the maxi jackpot! You can’t gamble any jackpot win, unfortunately.